Some of our younger readers may not even remember Wesley Snipes as a big screen force, but this slice of 1992 premium hokum certainly had a big-scale release and, I readily admit, sits right up there among my favourite stupidly enjoyable flicks. With Die Hard and Under Siege having cornered the market in the one man versus a virtual army in their respective settings (skyscraper and ship), Kevin Hooks’ film takes to the skies. Brit psycho Charles Rane (hence ‘Rane of Terror’ – get it? ), a convicted plane hijacker and all-round nutcase, is to be transferred across the States to stand trial. Naturally, despite the fact that this is a dangerous hijacker we are talking about here, the authorities decide to pack him off on a plane – not a chartered one of course but a passenger plane chock full of collateral damage. Surprise, surprise, not long after take-off a clutch of the plane’s crew reveal themselves as Rane’s lackeys and we have a full-scale breakout on our hands. Could anyone stand in their way and save the day? 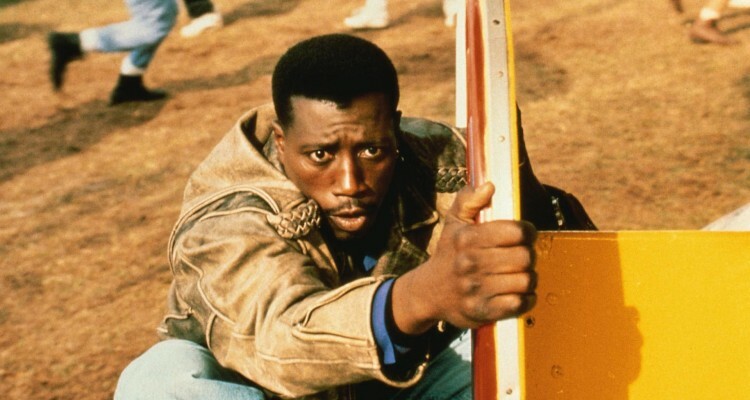 Well, this is where Snipes comes in, as security specialist John Cutter, who (just happening to be on the plane) sets about shooting, punching and kicking his way through the goons to bring them to justice. Back in 1992 our Wesley was still a big draw, so I was able to take in this 80-minute romp at the cinema and boy did I enjoy it. 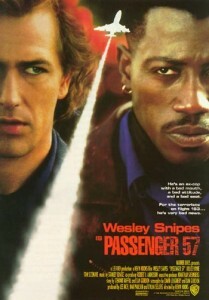 I think the main reason for Passenger 57 being such bloody good fun is the sheer comedy in the script. And this is not one of those ‘so bad its good’ types, but something that clearly set out to give everyone a laugh. From Rane asking for his steak ‘bloody’, to Snipes bellowing that the villain ‘should always bet on black’, this opus runs Commando very close in the ‘every line being a one-liner’ stakes. Throw in a wildly manic performance from Bruce Payne as Rane, support from a villainous Liz Hurley as a psychotic air stewardess (yep, you read that right) and some nice set-pieces in the plane’s cargo and beyond and you have a recipe for entertainment. You also get a cameo of sorts from Tom Sizemore, harking back to the days when he was also something of a big name. I have no real idea why now looking back on it, but for some reason I also went out and bought the soundtrack to this after seeing the flick – I am not proud of that I can tell you. But retail blunder aside, Passenger 57 is a definite two thumbs-up from me and a guaranteed thrill-ride for anyone who gives it a chance. Liz is awesome in this film. I didn’t know it was her till recently. Trivia – was she REALLY a air stewardess in this film gone bad? And did she die at the end or was just unconcious? The moment Marvel films became cool?